Nelson's award-winning heritage venue The Boathouse opens her arms to welcome you all back on board after a lengthy shut due to major storm damage in February. 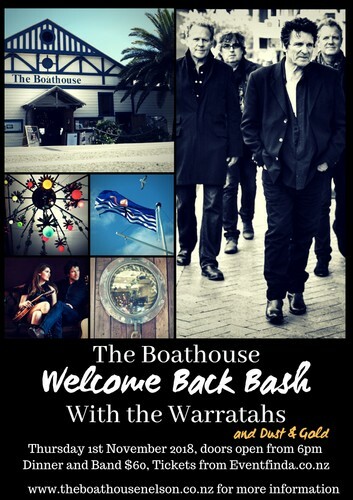 Kiwi legends the Warratahs, supported by Nelson due Dust and Gold join us in a Welcome Back Bash. This is the very first gig at The Boathouse since January and the building is ready to be filled with music and dance. We've missed you all over the months and are ready to party.